Custom arrangements for any event. 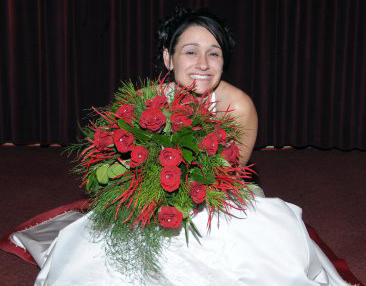 All of our designs our custom made to your dreams and imaginations by floral designer Jennifer Holloway. We will custom design your floral arrangements to match the flower and color of your event. After we decide which flowers, how many are needed, and other details, we will give you a quote. If you wish to use our items such as multiple styles and sizes of vases, round table mirrors, colored stones, wood discs, etc., we rent these at no cost, as long as you book with a DJ and Photo Booth Combo package. Flowers by design. Truly unique. Jennifer has been a floral designer since 1998, while getting her certification in landscape and floral designs. Jennifer has won many awards and has been nationally recognized on Extreme Makeover: Home Edition for their Christmas episode making wreaths and all the floral displays. © Megabeat Entertainment. DJ, photo booth, flowers, and uplighting for events. Headquartered in Columbus, Ohio.